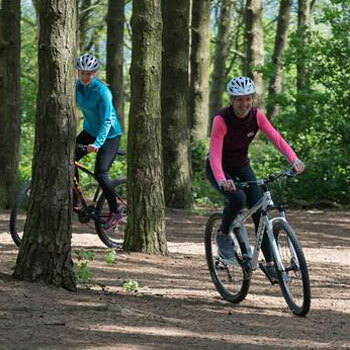 Mountain bikes are great fun for those that like a little adventure while riding. Road bikes are fine for a little exercise during the week, on a commute to work. But, they don’t offer that opportunity for exploration on country trails. There are lots of different types of models out there claiming to be the best mountain bike, but they often have very different specs. How do buyers find the one that is best for their needs out on the trails? You need to understand your purpose with the mountain bicycle before choosing the best features. What is the aim with this bike? Do you want to enjoy fast-paced races in the local countryside with friends? Are you after a long ride for exploration in some different types of terrain? The answer to this question will determine the style, and the components to look out for. Those that are in this alone for the adventure may prefer cross country bikes. They typically have hardtail suspension, light weight and larger wheels. Trail mountain bikes are as much about the descent as they climb. They are sleek, fast and responsive with good suspension and smaller wheels. Then there are the Enduro bikes for competitive riders that want perfect climbs and improved times. These bikes are sleek, aggressive and built for more experienced users. The suspension plays an important role here in the performance of these different bikes. Some bikes have full suspension across the model, while others tend to focus on the front wheel. The latter are the hardtail bikes with the rigid rear end. The appeal here depends on purpose and preference. There is less control here, which means some riders will prefer the control of the full suspension mountain bike. This is also more comfortable on those rougher trails. Another factor to keep in mind here is the gear system. Not only will you need the right amount of gears, you need a gear system that is responsive and well-made. Many riders like to stick with known-brand names here. Shimano is a common choice. Finding the right components for the best MTB riding experience. Whatever the purpose and terrain, you need a bike that is responsive and able to handle the ride. 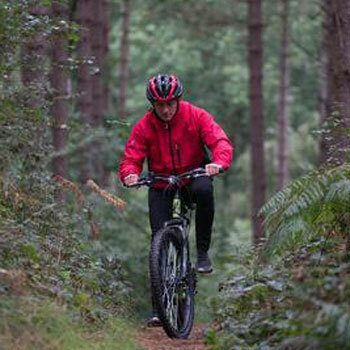 The suitability of the mountain bike often comes down to some key components, such as the weight, the brakes and the tyres. The weight will determine how easy it is to ride – as well as the ease of transportation between sites. Carbon fibre frames are great for high-performance mountain bikes because they provide a light feel and shock absorption. Cheaper models tend to have aluminum to keep them light. Beware of steel frames because even though they are tougher, they are much heavier. 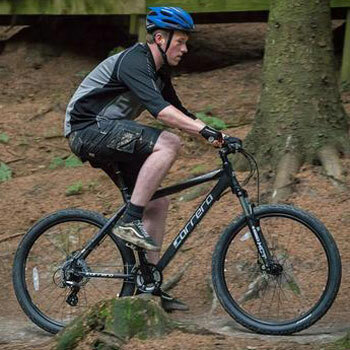 The response of the bike on the trails also has a lot to do with the brakes and tyres equipped on the model. There are usually choices between hydraulic and mechanical disc brakes. Check to see if there are front and rear brakes before buying. The better the response time, the better the stopping power. Current owners should be able to vouch for this in user reviews. As for the tyres and wheels, there are choices on the size. Some like to stick to the traditional 25’’ wheels, while others like the stability of the thicker 29er bikes. On the subject of the wheels, check to see if the front wheel is removable. A quick release here helps where transporting bikes to the countryside. What about all the finishing touches on these impressive bikes? The final aspect to consider with this mountain bike buyer’s guide is the finer details that finish it off. The basic frame and vital components above create the right performance, but there are other elements to consider. There is also the comfort of the bike, seen in both the seat and the grips around the handlebars. How much padding is there, and will new owners need to upgrade before they start out on the trails? There are also consideration like the quality of the pedals – if they are even included – and little extras like the ties on the cables and water bottle holders. These little details can make a big difference. The look of the MTB might not seem that important compared to the other features mentioned here. It doesn’t really matter what colour the bike it, as long as it performs in the way that users need. However, the design is still the first thing that people notice, and nobody wants an ugly bike. There is a nice rush when you are complemented on both your riding and the ride itself. There should be plenty of colour choices out there, but there is a chance that many companies will also throw lots of branding at the bicycle too. Watch out for the quality of the paint job and finishing touches too. Some of the cheaper bikes may be more prone to damage and cosmetic issues. This is where it helps to read all the specifications and available consumer reviews before you buy. The best place to start when choosing between brands is with the specifications on the bikes. There are lots of factors to consider, and the devil may be in the details. This side-by-side comparison will help when looking at the precise components used, the weights and other technical elements. At the same time, it helps to read the user reviews. This is where you can see if the promises meat the real life experience. What is the quality like? Is it comfortable to ride on tough trails? Is it as responsive and agile as it should be? With these reviews and specifications, as well as the information from this mountain bike buying guide, you should be able to find the bike that best suits your needs.